Childhood obesity is a hot button issue in the news today. It is predicted this next generation will have a shorter lifespan than their parents. That is only a prediction, we can do something about that. 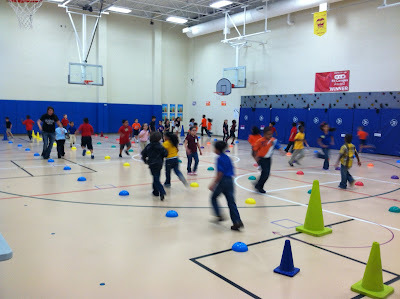 I teach Physical Education. Passionately, I educate kids the important of physically active and eating healthy. They eat it up! They love sharing what healthy choice they have made. Kid's will be excited about what you are excited about. That is the first and best way to inspire your child to lead a healthy life. 1. Modeling- This is my most powerful teaching tool. Modeling healthy eating habits and exercising with them gets them excited to do so as well. Children watch EVERYTHING we do. They copy most things they do. If you look like you enjoy what you are doing; they want to do it as well. If you model healthy eating and a physically active life your child will follow your lead. 2. Play- Children love to play. Toddlers to teens love to be goofy and play around. Encourage it. Children playing tag, Capture the Flag, shooting hoops, or riding bikes are getting phenomenal exercise, learning valuable social skills, and thinking critically about different situations. (The teacher side of me is coming out) I remember playing basketball in the driveway with my dad and brother. We played basketball games probably every week or two all the way through high school. My family STILL has a yearly basketball game at Christmas. All the uncles, nieces, and nephews go to church and play basketball. I won't ever forget these times just playing around with my family. 3. Let Them Join You- We had a boy at school two years ago that began jogging. with his father every week. They would turn in the miles they ran every week. As the end of the year rolled around we tallied up their miles- over 65!! The boy was 10! If you are going jogging let them jog with or ride their bike. They may go slower, need water, and definitely more breaks, but kids are very capable. We run every week at school and 7-10 year old kiddos will average 1.5-2 miles in 30 minutes. 4. Give Them A Goal- Goals are important for health and fitness. We as adults try to achieve greater levels of health by setting goals and working hard to achieve them. I am not about to advocate for getting your child into a lifting program, but they can have goals as well. My, then 4 year old nephews, ran a 5K. They have run many races actually. 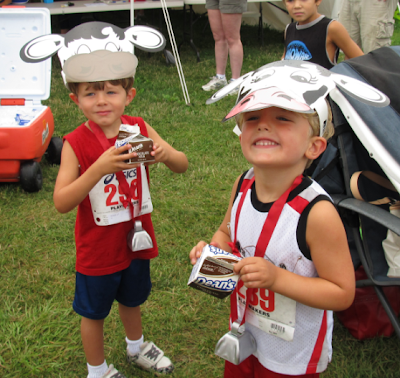 Sign them up for some kids races or activities. Register them for sports. Get involved at school, the YMCA, or the Boys and Girls Club.These places offer great programs for kids, will get them to achieve goals they have set, and are focused on instilling the desire to lead healthy lives. 5. Kid Friendly Exercises- Whether you do these on the weekend, during commercials, or after dinner they will get your kids excited about exercising. Here is a list of some exercises and activities we do at school that kids love. Challenges- Jumping jacks, jump rope, racing, or push-ups it doesn't matter if you challenge them or they compete with someone else they will give it everything they have. Exercises- Mountain climbers, bicycle crunches, the crab walk, and shoulder touches (In the up push-up position pick up one hand and touch it to your opposite should, repeat on other sides, then keep going) are great for commercial breaks. Video Games- I know these can also be the enemy, but why not use them for good. Any dance game from DDR to Just Dance will have the kids sweating all night. The Kinect and Wii allows them to move during most games. Just make sure they actually move and don't do any of this flick of the wrist stuff. Whatever you do be sure to have fun, stay safe, and share with your children the importance of living healthy and being physically active. In honor of back to school Thursday's post will be out healthy eating choices for kids and how to teach them to make healthy choices for themselves. What are your kids doing to live healthy? 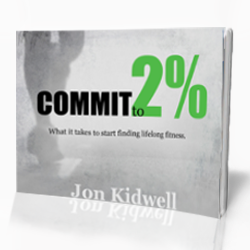 Share Jon Kidwell | Finding Fit with someone by copying this linking www.jonkidwell.com and e-mailing it or posting it.